I expect folks might have been wondering if all the work on castering and passive steering was going to lead to anything. Well, the answer to that is "yes". Not only was the intention to contribute towards the knowledge base of the community but also to lay the groundwork for a model. And here it, or, more accurately, they, is/are. 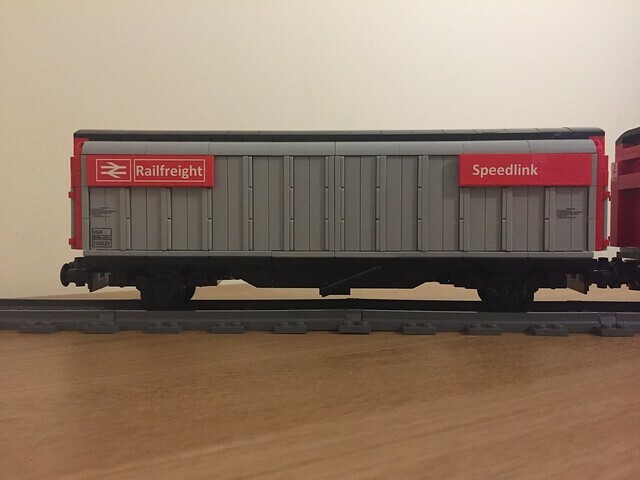 These are a pair of BR Railfreight VGA vans in "as built" condition. 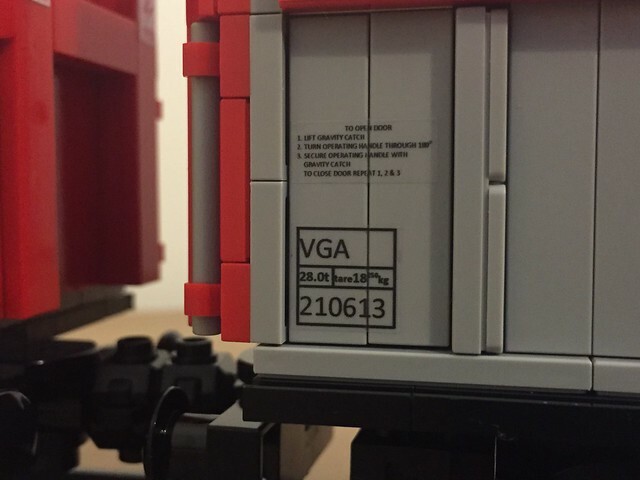 The VGA is a 42 foot van with a wheelbase of 29 feet 6 inches designed to carry a 29 tonne payload and with a cubic capacity of 75 cubic metres. Based loosely on a German design of van built for Ford UK, these vans had curved bodysides meeting a narrow central roof strip. Each side was formed of a pair of light alloy sliding doors that gave 7 feet of vertical clearance, allowing for easier loading and unloading using cranes or forklift trucks. Following the construction of a single prototype in 1981, a fleet of 250 VGAs was commissioned the following year. Since that time they have carried everything from explosives to bottled water and the majority of the fleet is still on the books as at the present moment, although the traffic for this type of vehicle has dwindled in recent years. 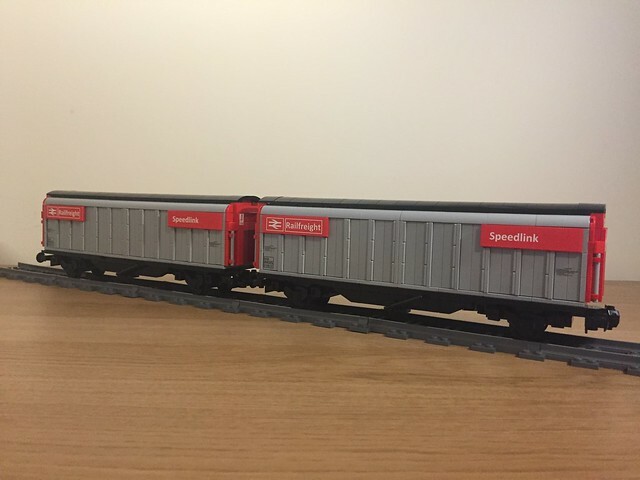 However these vans can still be seen in use as brakeforce vehicles, particularly involved with the movement of new multiple-unit passenger trains. The model is largely 7-wide, although the running boards and brake handles probably make it 8-wide in total. Using the scale of 1 stud = 15 inches the body comes out at 34 studs long with a wheelbase of 24 studs. Some idea of the length of the model can be appreciated in the photo below (even though it's not the greatest quality). I've opted to use passive steering for the axles in exactly the same way as in my earlier experiments. As ever, all the stickers are homemade by printing directly onto self-adhesive vinyls. Even at such small scales I'm pleased that both the TOPS data panel and the door operating instructions remain legible. And how the real vans looked. Comments are invited as always. 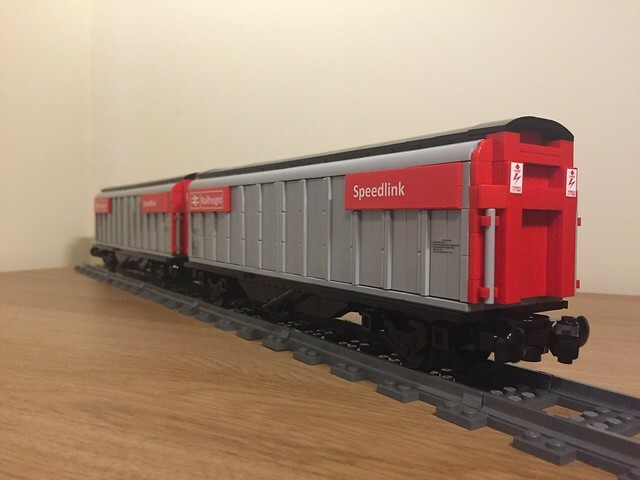 Speaking for myself, I'm very pleased with these models because they are not only my first "full scale" LEGO railway vehicles, but they are also the first that haven't had to go through any sort of redesign during the build phase. No additional bricks were required and my stock of surplus parts didn't grow as a consequence. As soon as I saw the title I was excited, and the content does not disappoint! You've captured the essence of these vehicles perfectly, and the stickers really work well on them. 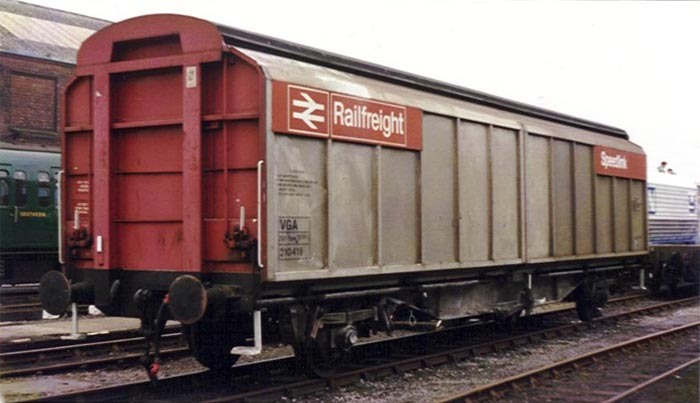 Now we need some more Railfreight wagons, perhaps the similar VCA van wagon or open wagons OBA and OCA? They are all long-wheelbase, air braked stock. And then a guards van, and a Class 20 to haul them... 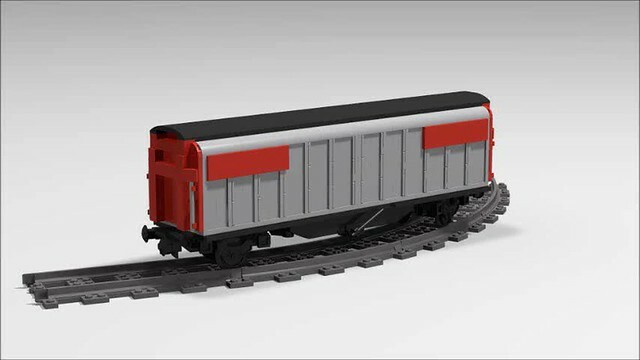 I'm getting carried away, but I do hope these wagons are incorporated into a suitable train; I think they'd look stunning. @Hod Carrier These are very nice indeed! thanks for allowing us to follow along during the prototyping phase! Very nice creation, I like a lot these long-bed two axle cars you're working on!!! Ooh, those are nice! Really detailed too! Very nice looking. How did you make the stickers? It must have been difficult to make them legible in this size. Edit: Just read the info about the way you printed those stickers. Anyways, what kind of printer do you use? Thanks for the wonderful feedback. I'm glad you're liking them too. @ColletArrow I suppose I really should think about some motive power for these, and maybe a few more wagons to join them, but it might be a long-term project. Because Class 20s usually went around in pairs I was thinking I should probably opt for something double-ended so that I would only need to build one. Regional bias dictates a Class 31 but I suppose a Class 25 or even a Class 33 would do. Watch this space, as they say. @FLBRICKS The stickers are perhaps easier to make than it appears. I do the layout on my netbook using MS Word. I prefer to set out a table so that I can control the size of the final print by changing the cell sizes and I find it's the easiest and most predictable way of getting the results I want. Then I add text or images and tweak the sizes, fonts and colours until everything looks right. Once I'm happy I turn the print quality up to maximum and run off the required number of copies. The fact that the graphics have remained legible is just down to good luck and good materials, I guess. I have a normal desktop inkjet printer (an Epson XP202) and print onto inkjet vinyl sticker paper which you can buy online (I get mine from www.photopaperdirect.com). One crucial thing to remember is to leave the printed sheet to dry for a while before handling it and then to give it a couple of passes with an aerosol craft sealant to prevent the printing from smudging, because the printed sheets are not waterproof and are prone to smudging even from normal handling. Then it's simply cut, stick and admire your handiwork. This looks very cool, especially the texture of the metal walls is captured perfectly! Wonderful. They look very realisitc. I suppose I really should think about some motive power for these, and maybe a few more wagons to join them, but it might be a long-term project. Because Class 20s usually went around in pairs I was thinking I should probably opt for something double-ended so that I would only need to build one. Regional bias dictates a Class 31 but I suppose a Class 25 or even a Class 33 would do. Watch this space, as they say. Oh, I will, I will! A Class 58 might be interesting; they were mainly used on coal trains, but did find work elsewhere. In terms of LEGO, despite the fact that the central section would have to be 4 studs wide, it would be DBG - very easy to hide the battery box in! They do look superb. Probably one small improvement would be to use 2x4 tiles for where you have stickered the decoration, just so there are not decorations over multiple parts. Although there is no 2x6 tile if you want consistency on the other panels, so you'd need to stick with either the two 1x6 tiles vertically, or go with three 2x2 tiles here (to keep them 2 wide). 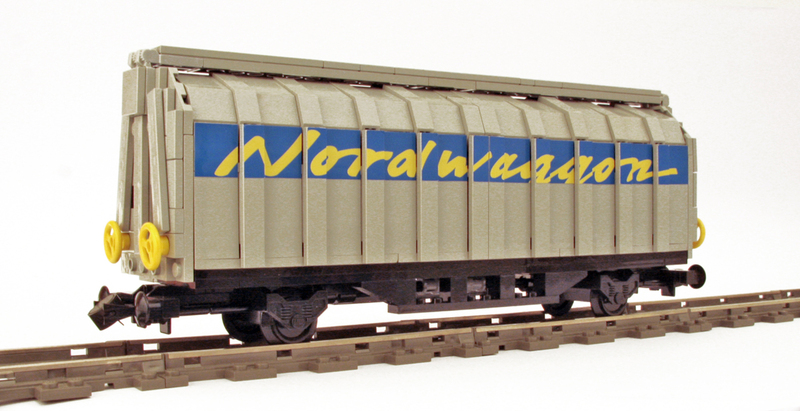 Very nice freight cars, I especially like the stickers and the snot work. @ColletArrow I guess a Cl58 might be an option. We shall see. @MAB You're right, it's not ideal to have the stickers breaking across more than one part, but I didn't have many alternatives. As you say there is no 2x6 tile so there were always going to be joins where I didn't want them, so I had to decide how many I was willing to put up with and in which direction they would run. In the end I opted for the results you see here which, for the sake of consistency, I have continued onto the panels that are just 2x4. If TLG ever bring out a 2x6 tile I shall swap the body panels over in a heartbeat. @baard Having shared the videos of the prototypes undergoing testing, I suppose I should also make a video of the finished models going for a spin. I'll try and get something done before the end of this week, but time is tight at the present moment. @Paddi I wanted the ribs to be only 1 plate thick, but they had to be 1.5 plates thick for mathematical reasons. It was the only way I could get the right number of panels and ribs in the length of the vehicle. Ha ha!! They look good but they're really only cosmetic and not actually part of the structure of the car. Good looking vans. They are spot on to the reference picture. Wow this is an epic work Hod Carrier! The shape is excellent and colors are among my favorites. The stickers are the icing on the cake. The mechanism that allows you to keep only two distant axles is very well implemented. These cars are fantastic, I trust that you will soon have videos posted of them running through crazy curves? 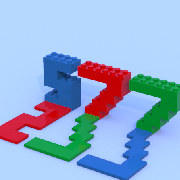 @LEGO Train 12 Volts Wow!! That's a beautiful wagon. I estimate it's about the same length as the VGA but a much more challenging (and rewarding) shape. Whoever produced that must be proud to have that running before an appreciative audience. 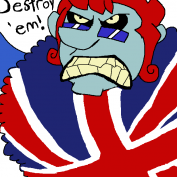 @zephyr1934 It would be remiss of me not to. The more I look at these cars and the more I fall in love! The video is simply awesome ...thanks for sharing! This is stunning. Not only the passive steering but the car itself as well. It is an absolute beauty capturing the curves perfectly. Thanks everyone for the kind words. I’m glad to have brought smiles to so many faces. That's very kind. Thank you. I wasn't consciously going for a studless look, but it just seems to have turned out that way. There are some exposed studs on the chassis, but only a very few. Most kind. May I have a chocolate chip...?